28km, 3 days/2 nights, moderate, suitable for most fitness levels and ages. The clover leaf hike starts and finishes at the Cape St Francis Resort. You can start any day of the week, however this is an ideal weekend hike. 14h00 Arrive at the Cape St Francis Resort, book in and unwind by enjoying an unguided hike through the Irma Booysen Flora Reserve (around 6km) before you return to the Resort for a late afternoon canal cruise and dinner at the Joe Fish Restaurant. Afteer breakfast, you will be transported to the Eskom Conservation Reserve on the outskirts of St Francis to enjoy a 16km hike back to the Resort – the hike has many highlights. It starts with a short section through indigenous coastal forest and thicket, a dunefield and once on the coastline, you will see the second largest blowhole in Southern Africa, an unmarked KhoiSan grave, shipwrecks, middens, you will visit the SANCCOB Sea Bird and Penguin Rehabilitation Centre before you finish the day’s hiking at the Resort. Once again dinner is served at the Joe Fish Restaurant. The trail continues from the Resort around Shark Point. Once at Port St Francis, the only privately owned harbour in the country, you will enjoy a calamari tasting and see a chokka cleaning demonstration. 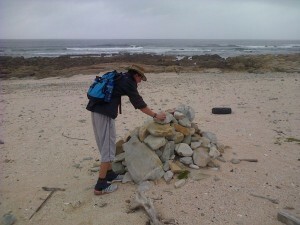 You will hike back to the Resort through the Cape St Francis and Seal Point Nature Reserves. Distance around 12km. The hike is guided and fully catered to ensure the best experience for you. The rate includes all meals, transfers, the SANCCOB visit, calamari tasting, canal cruise. Rate on request as it depends on the amount of hikers.